Formula 1: The importance of getting the right data at the right time. [Per Åsberg] How many sensors are built into an F1 car? [Damiano Molfetta] Depending on the configuration, we may have a minimum of 150 sensors installed in the car (in race configuration, for minimum weight) and more than double that for test sessions. Anyone familiar with Formula 1® will have seen that sometimes cars are fitted with complicated rakes, used to scope the aerodynamic flow field around the car, and any such rake can be equipped with more than 100 sensors. Also, for thermal analysis, infrared cameras are used, which give hundreds of temperature measurement points on the surfaces under investigation. The first place is the tires, but it could also be bodywork parts of which we are interested in knowing the temperature. It could be that we need lighter materials for some parts, which can sustain the temperatures in the area. In addition to physical sensors, we also have virtual ones with values that are determined by our software in the car: by processing the sensor data, we calculate further variables of interest. An example could be the brake torque, which is calculated from the brake pressure and the brake disc temperature-using model of the disc-pad friction pair. For the end user of the information, there is no difference in the way the brake pressure and the brake torque are determined, both are “just” numbers, but how those are generated is obviously quite different. The reliability and quality of the sensors are very important but equally important is to have validated models that can enhance the level of information. To give an idea, from those 150 physical sensors we can end up logging up to thousands of variables in total. [Per Åsberg] That’s a lot of sensors. What do you do with all the data? [Damiano Molfetta] There is a huge amount of data generated, and one of the key aspects is to make good use of it and not just be scared by it! In fact, you need to first concentrate on the basic parameters that guarantee the car is running safely and reliably. Then it is about monitoring the main performance drivers in order to make the right setup decisions. Filtering the data, out of those thousands of variables, is a very important task and one that cannot be improvised. In fact, engineers new to the field tend to be overwhelmed and feel a bit lost at first, but by presenting the data properly and just concentrating on the relevant subset of data, one finds the way into this quite quickly. For sure, there is not enough time and manpower at the track to look at all the data, so track engineers concentrate on the first order parameters. The whole data is also sent to the factory, where another group of engineers will analyze the results and support the track operation during the race weekend. They will advise the engineers on the track on particular issues, help with the setup of the car or analyze specific test items. They then report back if the test was successful, whether it needs to be repeated, etc. Some of the data is also for long-term projects, e.g. to get statistics to refine load cases on various components to be used for the next re-design or next season’s car. Usually, we look at the data of the previous year’s Grand Prix weekends in preparation for a race weekend. Lessons learned cannot be forgotten! [Per Åsberg] How is sensor data gathered, interpreted and effectively communicated? [Damiano Molfetta] The sensor data is rarely used as it is. There is certain basic information to which simple thresholds apply, like brake wear or maximum temperatures and loads, but you always tend to look at trends to anticipate issues. Also, in the case of simple min/max thresholds, you want to avoid being distracted by singularities like single spikes in sensor data or specific sections of the track, which may not be relevant. Pretty much all of the data is filtered, which allows engineers to concentrate on genuine car issues. In addition, how the data is presented, especially in real time, makes the difference. For example, waveforms on time base are good to spot trends like a leaking circuit, x-y plots with pressure as a function of engine speed tell if mechanical pumps are fine, color-coding of channels to help identify them easily, lap time comparisons on different set-ups of the car help to find gains, etc. There are uncountable ways to present the data. In fact, it can also be misleading, as the complexity and amount of data can be interpreted in different and conflicting ways. We have centralized the data processing, so all the data that is logged in the cars gets centrally processed and distributed to all users. In that way, the source data and the model-based calculation are the same for all users. [Per Åsberg] Are there dedicated data people on the team that makes the information usable/understandable for the pit wall and drivers? [Damiano Molfetta] There are several people involved in making the data available and reliable. For each car, we have an Electronics Engineer that makes sure the telemetry stream is available and distributed to everyone who is involved in the data evaluation. The whole telemetry chain relies on the track infrastructure and a garage IT system, which is looked after by a dedicated engineer. The data needs to be sent to the factory in Hinwil from every track around the world. Our IT team, as well as support engineers on track, make sure the data link between the track and factory runs well. A lot of people are also involved in maintaining the post-processing tools we use. [Per Åsberg] Have there been any races/sessions where data has had a meaningful benefit? [Damiano Molfetta] Without data, Formula 1 would not be the same as it is nowadays. Formula 1 is a high-tech sport. Just to give an example of how important data is to run a Formula 1 car: If telemetry does not work, we do not get the real-time data of the car, it would not make sense to run and put mileage on the parts without knowing how they behave, so we prefer not to leave the garage and sort out the telemetry first… unless the qualifying session or the race is about to start, those we do not want to miss! [Per Åsberg] Do you use data from other sources and how do you integrate that into your systems so it makes a car’s sensor data more meaningful? [Damiano Molfetta] Yes. The weather forecast is also fundamental to define the set-up of the car. Not only the possibility of rain can have a primary effect, but also temperatures (in terms of cooling) or wind intensity as well as direction (aero tests need to be reconsidered). On the other hand, the track temperature has an influence on the tire management. We also have data coming from the GPS systems installed on every car, so we know in real time where our competitors are on track and can adapt our strategy. For example, to send our drivers at the right time on track to secure that they have a lap without traffic during qualifying or when to pit during the race. All this information needs to be processed and evaluated – a huge task! It certainly offers new possibilities in order to improve understanding of our and our competitor’s car performance. [Per Åsberg] What do you see as the future role of data in F1? 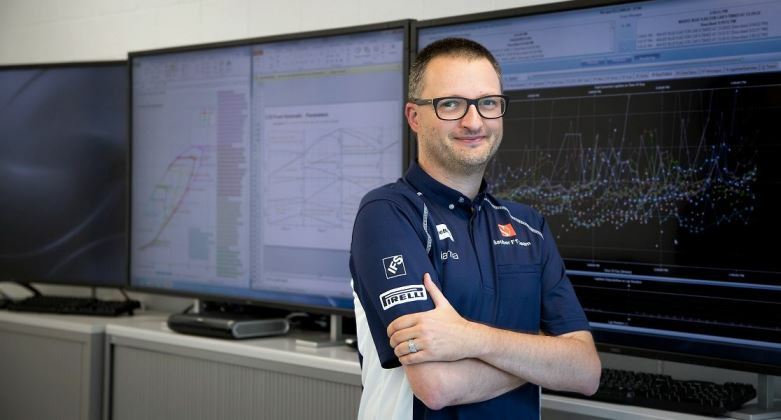 [Damiano Molfetta] Data nowadays is central to any decision making in Formula 1; there is no room for assumptions just based on feelings or experience. The level of competition is very high, so you can only find the last bit of performance in this level of detail by using quite specific data analysis. The hybrid power units introduced in 2014 have further raised the game, given their level of complexity. We still have not explored all the possibilities yet. New sensors technologies will make measurements in areas that are now unexplored possible. With additional information, new and more reliable model-based analysis and simulation will be possible. The challenge will be how to manage all this data and to make use of it. The ones who do not love challenges should not work in Formula 1!